I have already posted several times in reference to redecorating my conservatory/dining room. My last post was about choosing a mirror to place above the console table. I think i am going to choose a wooden one placed in a panoramic position as suggested in one of the ideas. (see previous post for ideas and more photos.) my question is seeing as I am not painting the furniture will a wooden framed mirror be too much? 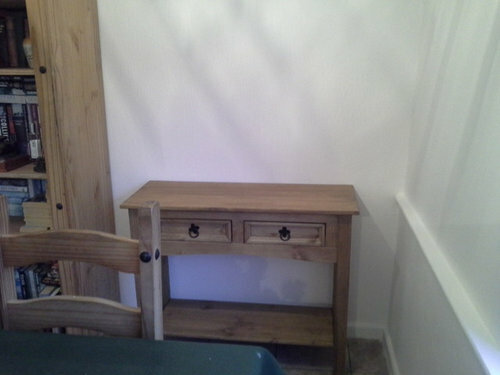 Also ideas for how to accessorise the console table and bookcase would be much appreciated. Another discussion was what to do with the space where the radiator is. We have decided as suggested to have it moved over so that it is more central on the wall and have a narrow console built over it. ideas as to what to put on it anc above it also appreciated. Thank you for all the ideas that I have recieved regarding my previous posts. The wooden mirrors were good but IMO I think it will be too much wood with another wooden console. It could however work depending on what you do with the accessories. Or you could look at something like this but bigger? For the console, you try tables lamps with a patterned ceramic vase in the middle with flowers or an urn with a plant. Or a collection of ceramic jugs with a stem in or jam jar type vase. Vintage or Mercury glassware also looks nice as does a candelabra or candlesticks. Just make sure things are of differing heights. For the bookcase, could you clear 2 shelves and add a collection of mismatched pastel crockery that could include cake stand, milk jug etc? Maybe a small collection of clocks on the walls or vintage tea plates in different patterns. I would have a look around local antique or secondhand shops for inspiration. If you want anything new maybe try Dibor or Live, Laugh, Love. I think something like this large window mirror: https://www.jossandmain.co.uk/The-Colour-Masterclass-Manhattan-Mirror~PRH13693~E8244.html?from_product=0 . It's got the whole distressed thing going on synonymous with shabby chic. 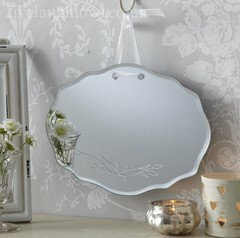 Also have a look in TK Maxx, always some interesting pieces perfect for the shabby chic look. POLL: Conservatories and garden rooms - yay or nay? If you had £1000 to spare, what would you buy? Please help me with my kitchen! !